Blades are precision made of heavy gauge, .025", high carbon steel and can be used in all standard utility knives. Five high carbon steel blades; fits most utility knives. Standard heavy duty, high carbon steel blades. Precision-honed edge for consistent and extended cutting life. Fits most standard utility knives. Blades are .024". Five blades made of finest cutlery steel. Fits Sheffield 12116, (460.0748) and all midget utility knives. Regular duty utility blade for light sheet materials, paper and cardboard; includes five 2 "x .17" blades. Micro carbide dispersed metal delivers up to 3X longer life than standard carbon blades; precision grind process removes the burr from cutting edge for cleaner cuts; optimized grind angles deliver improved sharpness for less repeat cuts. Made in the USA. For industrial, professional and DIYer applications. High quality manufactured steel. Designed to fit Wiss brand utility knives and most standard utility knives. 0.025" blade thickness. Sharpest, strongest, longest lasting utility blade ever; 75 percent longer life; 35 percent sharper; 20 percent stronger. 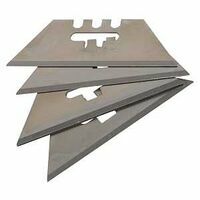 Heavy duty blades fits most utility knives. Five .025" thick blades. High carbon steel blades; snaps on the score for sharp tip. Stays 10 times sharper than traditional utility blades. The steel body helps to prevent breaking of the blade. Blades are Bi-Metal technology with a high speed steel cutting edge that stays sharp longer. Fits most standard utility knives and are flexible to last longer. Heavy duty blade, 100ct safety dispenser. 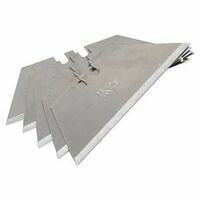 Contractor grade SK2 steel blade, 0.24"-0.6mm, thick. For use with utility knives, trimmers, and scrapers. Includes safe blade dispenser and 100 blades. Micro carbide dispersed metal delivers up to 3X longer life than standard carbon blades; precision grind process removes the burr from cutting edge for cleaner cuts; optimized grind angles deliver improved sharpness for less repeat cuts. Made in the USA. Standard heavy duty, high carbon steel blades. Precision-honed edge for consistent and extended cutting life. Fits most standard utility knives. Blades are .024". Sharpest, strongest, longest lasting utility blade ever; 75 percent longer life; 35 percent sharper; 20 percent stronger. High carbon steel blades; snaps on the score for sharp tip. These blades have a grinding geometry that offers an edge that is 35% sharper. They are specially heat-treated blades. Induction-hardened cutting edge allows longer cutting and few blade changes. Made of Sheffield cutlery steel, five blades per pack. Can be used in all standard utility knives. Blades are Bi-Metal technology with a high speed steel cutting edge that stays sharp longer. Fits most standard utility knives and are flexible to last longer. Sharpest, strongest, longest lasting utility blade ever; 75 percent longer life; 35 percent sharper; 20 percent stronger. 5-pack, heavy-duty, 0.025" thick blades fit all utility knives. For industrial, professional and DIYer applications. High quality manufactured steel. Designed to fit Wiss brand utility knives and most standard utility knives. 0.025" blade thickness. Blades are Bi-Metal technology with a high speed steel cutting edge that stays sharp longer. Fits most standard utility knives and are flexible to last longer.